When Napoleon Bonaparte (1769-1821) was born no one could have supposed that he would rise to become Emperor of France and, due to his success in the Napoleonic Wars, become regarded as one of the greatest military commanders of all time. Similarly none could have imagined that the tiny uninhabited island of Ascension Islandwould become so transformed by his eventual defeat and exile to St Helena. Ascension Island was allegedly discovered in 1501 by the explorer João da Nova, but it seems he did not register the discovery. Thus the island was re-discovered in 1503 by Afonso de Albuquerque who sighted the island on Ascension Day. Being dry and barren, it had little appeal for passing ships although it was used irregularly by the East Indies fleets and others for collecting fresh meat. Mariners could hunt for seabirds and the enormous female green turtles that laid their eggs on the sandy beaches. The Portuguese also introduced goats as a potential source of meat for future mariners. However, for Ascension Island, everything was to change in 1815. On 15th October 1815 a squadron under the command of Rear Admiral George Cockburn put into St Helena with the prisoner Napoleon Bonaparte aboard. Fearing that Ascension could be used by the French to launch a rescue mission Cockburn dispatched two brigs, HMS Zenobia and HMS Peruvian, to Ascension Island. On 22 October 1815 Captains White and Dobree came ashore, raised the Jack and claimed the island for His Britannic Majesty King George III. The Royal Navy officially designated the island as a stone frigate, "HMS Ascension", with the classification of "Sloop of War of the smaller class". A naval garrison was established and in the following years British troops changed the whole place into a little town with houses built of stone, a fortress, a hospital and a shop store. And so the garrison developed. Water was found at Dampier’s Drip (143 gallons per day), in Breakneck Valley (300 gallons per day), and on Middleton’s Ridge (300 gallons per day). The rocks lying close to Fort Cockburnwere dressed with stone and turned into a landing place, (now the Pier head). A pond was constructed to keep turtles, and alongside this a small boat harbour was built. 1821 saw the death of Napoleon but rather than being abandoned Ascension became a victualling place and recuperation base for the West Africa Squadron then engaged in anti-slaving duties on the African Coast. 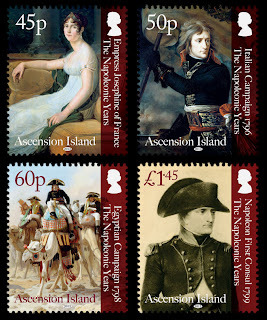 This series of postage stamps celebrates Ascension Island’s Bicentenary of British Settlement, showing historical scenes, paintings and illustrations from the Napoleonic Years. 45p Josephine Bonaparte (1763-1814) at Malmaison circa 1801 by the French painter Francis Pascal Simon Gerard (1770-1837). Oil on canvas. (Photo by Universal History Archive/Getty Images). 60p Napoleon and his General Staff (oil on panel). Napoleon’s Egyptian expedition included a group of 167 scientists. Their discoveries included the Rosetta Stone which provided the key to modern understanding of Egyptian hieroglyphs. (Photo by Jean Leon Gerome/Getty Images). £1.45Napoleon as First Consul, based on the picture by Jean-Baptiste Isabey. Sheet Borders: Napoleon Bonaparte before the Sphinx during Egyptcampaign, 1798, painting by Jean Leon Gerome, c. 1868 (Photo by Apic/Getty Images). When Napoleon came to Egypt the Sphinx was buried up to its neck in sand and it’s believed that his artillerymen used its face for target practice. The Battle of the Pyramids was fought on 21 July, about 24 km from the pyramids. General Bonaparte's forces of 25,000 roughly equaled those of the Egyptian cavalry. 29 French and approximately 2,000 Egyptians were killed, greatly boosting the morale of the morale of the French army.